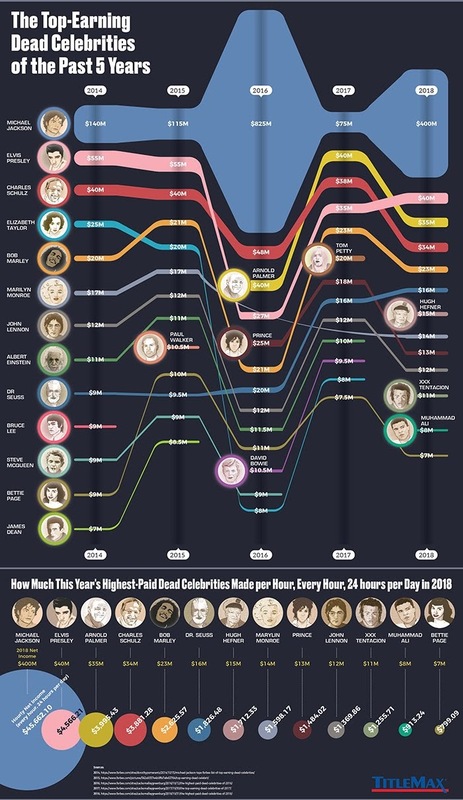 The Top-Earning Dead Celebrities of the Past 5 Years #infographic ~ Visualistan '+g+"
More than 40 years after his passing, fans of Elvis Presley still claim to see him walking the earth. While that may seem bizarre to some, what’s more outrageous is the fact that he’s still earning $40 million per year in death. The idea that “you can’t take it with you” simply doesn’t apply to some celebrities. Have you ever wondered what happens to the wealth of the uber rich and famous when they pass on? In some cases, they may actually earn more posthumously than when they were alive and active! For example, in 2018, entertainer Michael Jackson’s estate earned $825 million USD. 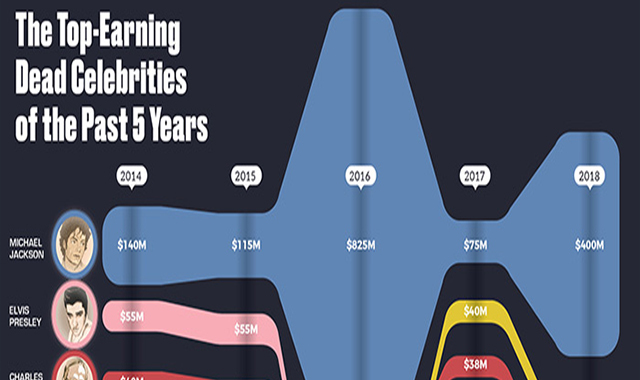 This infographic from TitleMax.com explores more than 20 of the top-earning deceased celebrities over the past 5 years. While you may not be surprised to learn that Michael Jackson tops the list, you may be surprised to learn that folks like Albert Einstein and Bettie Page made the list. See if one of your favorite famous people made the TitleMax wealthiest dead celebrity list, and find out how they made their money. Enjoy!